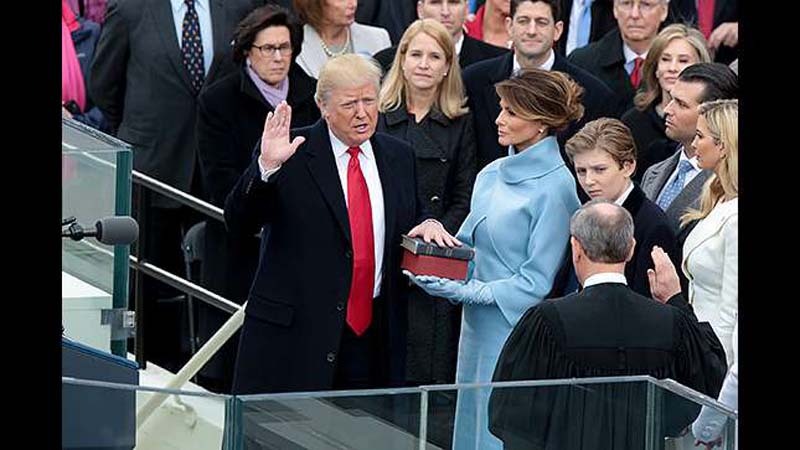 Former White House aide Omarosa Manigault Newman claims that President Trump wanted to use a copy of his book instead of the Bible during his swearing-in ceremony. Manigault Newman claims in her upcoming book, "Unhinged: An Insider Account of the Trump White House," that Trump pitched the idea of taking his presidential oath on a copy of "The Art of the Deal," according to an excerpt obtained by Slate Magazine on Saturday. [post_ads]"He asked me, 'Omarosa, what do you think about me getting sworn in on The Art of the Deal?'" Manigault Newman writes, according to Slate. When Manigault Newman questioned him about bucking the inauguration tradition, Trump allegedly responded with "Yeah. The Art of the Deal is a bestseller!" "It's the greatest business book of all time," Trump said, according to Manigault Newman's book. "It's how I'm going to make great deals for the country. Just think how many copies I'd sell - maybe a commemorative inauguration copy?" Trump co-authored the bestselling book in 1987 with Tony Schwartz. Schwartz has become a fierce critic of Trump's, tweeting earlier this year that Trump was "incapable of reading a book, much less writing one," after the president bragged about his writing skills. Manigault Newman's new memoir includes several explosive claims about her time working in the Trump White House. The former aide served as the director of communications for the White House's Office of Public Liaison before being fired by chief of staff John Kelly in December. Manigault Newman accused Kelly of firing her because she was close to getting audio of Trump using a racial slur. Manigault Newman also reportedly writes in her new book that the Trump campaign offered her a $15,000-a-month hush money contract for her to keep quiet about her time working in the administration. The president blasted his former aide on Saturday, calling her a "lowlife" while speaking with reporters at his Bedminster, New Jersey golf resort. The dig was Trump's first public denunciation of Manigault Newman's claims since she kicked off her book tour. White House press secretary Sarah Huckabee Sanders denied Manigault Newman's claims Friday, slamming her as a "disgruntled former White House employee" who is "trying to profit off of these false attacks."